Officers with the Lynn Haven (FL) Police Department reportedly found a stray dog wandering the streets and took him to get cleaned up and examined. The department soon discovered that the animal would make a perfect pet for the department, and would also serve a vital role for the community. Image courtesy of the Lynn Haven Police Department / Facebook. 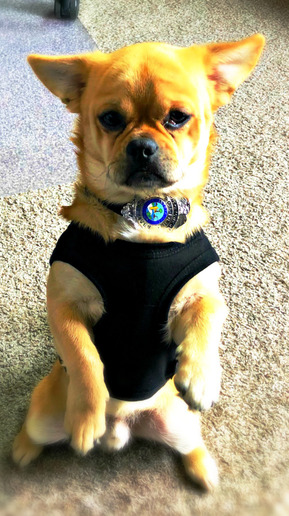 Mugshot—also known as Muggsy—was given his badge and uniform on February 12, 2019 and is the first K-9 for the Lynn Haven Police Department. He will perform the duty of an ESP/ESA—Emotional Support Pet or Emotional Support Animal. These support animals provide companionship, relieve loneliness, and sometimes help with depression, anxiety, and certain phobias, but do not have special training to perform tasks that assist people with disabilities like service animals do. "Muggsy was found wandering around the streets of Lynn Haven," the department said on Facebook. "His temperament and personality (and not to mention his mugshot...) won us over instantly and we knew that he had to stay. We knew that he would make the perfect pet for our department and would be a great friend to the Citizens of Lynn Haven and surrounding areas." The department added, "So far, Muggsy can sit, stay, lay down, beg, dance, and fetch. He loves watching and playing with the children in the park, as well as sleeping in the sun. He likes being scratched on his head and under his chin. He loves being cuddled, and snuggeled, and held in a lap. He is very patient and sociable around children and the elderly. His favorite food is beef jerky and his favorite toy is his old soft football."